Consequently, the reverse repo rate under the LAF remains at 6.0 per cent, and the marginal standing facility (MSF) rate and the Bank Rate at 6.50 per cent. 2. Since the April 2017 meeting of the MPC, global economic activity has expanded at a modest pace, supported by firming growth in major advanced economies (AEs) and in some emerging market economies (EMEs) as well. In the US, a tightening labour market is generating wage gains. Alongside, industrial production has steadily improved in recent months and retail sales remain robust, although home sales ebbed in April. Political risks remain high, however. In the Euro area, the recovery has been underpinned by consistently falling unemployment, rising retail sales and a brighter outlook for manufacturing reflected in purchasing managers’ and business surveys. In Japan, exports supported by a depreciated yen and industrial activity are driving an acceleration in growth. Wages and inflation, however, are depressed and holding back domestic demand. Among EMEs, the Chinese economy is stabilising, especially in manufacturing, but financial risks in the form of the credit-fuelled debt overhang could impinge on the outlook. Brazil appears to be emerging out of recession, although growth dynamics remain fragile due to worsening labour market conditions and political turmoil. In Russia, the strengthening global environment is supporting the recovery with improving macro fundamentals. South Africa is grappling with structural constraints which are depressing economic activity. 3. The pick-up in global merchandise trade volume since the start of the year has been sustained in Q2 of 2017, buoyed by strengthening global demand as reflected in rising international air freight and container throughput. Crude prices fell to a five-month low in early May on higher output from Canada and the US, and remain soft, undermining the OPEC’s recent efforts to tighten the market by trimming supply. Among non-fuel commodity prices, metal prices have been retreating on expectations of weak demand from China. Bullion prices remain range-bound, while food prices eased in April but rose in May. These developments suggest that the inflation outlook is still relatively benign for AEs and EMEs alike. 4. International financial markets have been lifted by improving global growth prospects, broadly accommodative monetary policy stances of systemic central banks and generally positive incoming data. Increasingly, financial markets have shown resilience to geo-political events and have swiftly priced them in. This has been reflected in the reinvigoration of the reach for returns. Country-specific factors have modulated investor sentiment. Equity markets in most AEs have gained in Q2, surpassing past peaks in the US; boosted by corporate profits in Japan; and supported by easing political tensions and upbeat data in the case of the Euro area. In EMEs, equities have turned in a mixed performance, with high valuations across Asia, but weaker in Latin America on softer commodity prices. Bond yields in major AEs have been largely range-bound. In EMEs, yields have hardened in the few countries facing inflation pressures and political uncertainties, but for commodity exporters, there has been some recent decline. In the currency markets, the US dollar has weakened in May after dovish guidance by the Fed and unexpected political events. Since mid-May, the yen has shed its depreciating bias and appears to have gained safe haven appeal. EME currencies, which had depreciated on the strength of the US dollar, have steadied more recently on renewal of capital flows and risk-on investor appetite. 5. On May 31, 2017 India’s Central Statistics Office (CSO) released quarterly estimates of national income accounts for Q4 of 2016-17, provisional estimates for 2016-17 and revisions for the preceding five years. The growth of real gross value added (GVA) for 2016-17 has been pegged at 6.6 per cent, 0.1 percentage point lower than the second advance estimates released in February 2017. Underlying the revision is a downward adjustment in services sector growth in Q4 for the constituents of construction, financial and professional services, and real estate. Estimates of agriculture and allied activities have been upgraded to incorporate the all-time high production of foodgrains and horticulture in the year. GVA in industry has also been placed higher in the provisional estimates relative to the earlier reading to reflect the impact of new indices of industrial production (IIP) and wholesale prices (WPI) rebased to 2011-12. The new data reveal that a slowdown in activity in both industry and services set in as early as Q1 of 2016-17 and became pronounced in Q4. Moreover, the deceleration of activity coursing through the year has had underlying drivers that have been in operation since Q2. Components of aggregate demand reflect a contraction in gross fixed investment in Q4, reversing the turnaround evident in the second half of the year in the advance estimates. This is also reflected in the contraction in the production of capital goods in the new IIP. However, private final consumption expenditure recorded robust year-on-year growth. 6. On May 9, the Ministry of Agriculture (MoA) released its third advance estimates of foodgrains production, which confirmed the record level of output achieved in 2016-17 and, in fact, revised it upwards to 273 million tonnes. The MoA also set out its second advance estimates of fruits and vegetables on May 30, which was also a historical record. Benefiting from the bumper harvest, rabi procurement during Q1 of 2017-18 so far has been significantly higher than a year ago, replenishing food stocks and taking them to 61.9 million tonnes in May 2017, three times the buffer norm. On June 6, the India Meteorological Department (IMD) re-affirmed its forecast of a normal and well-distributed south-west (June-September) monsoon, which augurs well for the agricultural outlook. 7. The new series on the IIP released by the CSO on May 12 improves the coverage of industrial activity, realigns weights and reclassifies sub-sectors to better capture the underlying structural dynamics of the sector, and smoothens the impact of lumpy items on the index. As a result, industrial production expanded by 5.0 per cent during 2016-17 based on the new series (as against 0.7 per cent in the old series). Turning to the current financial year, the output of eight core industries decelerated sharply in April on account of contraction in coal, crude oil and cement due to structural constraints and low demand. Furthermore, electricity generation decelerated due to depressed demand pricing out relatively expensive thermal output. By contrast, the production of steel and fertiliser picked up, the former driven up by exports and the latter by expectations of a normal monsoon. 8. The business expectations index generated by the Reserve Bank’s April round of the Industrial Outlook Survey reflects optimism in the manufacturing sector in Q2 of 2017-18, driven by expectations of rising rural demand, exports and profit margins. On the other hand, the manufacturing purchasing managers’ index (PMI) moderated sequentially in May as employment contracted and new orders, both domestic and exports, slowed down. The index, however, remained in the expansion zone and the future output index accelerated for the third month in succession. 9. High frequency real indicators of activity in the services sector point to a mixed performance in April. In the transportation sub-sector, freight carriage by air and rail gathered momentum, and passenger car sales accelerated on the back of sustained strength of urban demand. Sales of commercial vehicles and three-wheelers contracted, however, reflecting in part the effects of new emission norms and technology changes. Two-wheeler sales remained depressed, indicative of still subdued rural demand. In the communication sub-sector, there was a strong growth in the subscriber base of voice and data services. The sustained growth of foreign tourist arrivals and air passenger traffic, both domestic and international, supported activity in the hotels, restaurants and the hospitality sub-sector. Both steel consumption and cement production were, however, sluggish, pointing to continuing weakness in construction activity. The services PMI for May rose to its highest reading since November 2016, with an expansion in new business reflecting improving underlying demand conditions, alongside optimism on employment. 10. Retail inflation measured by year-on-year changes in the consumer price index (CPI) plunged to a historic low in April, pulled down by a large favourable base effect which overwhelmed a momentum that was feeble relative to the historical record for the month. Underlying this surprising softness was a sharp fall in food inflation brought about by a deflation in the prices of pulses and vegetables. In addition, moderation in the prices of cereals, eggs, oils and fats and spices contributed to the loss of momentum. In the case of pulses, the large-scale augmentation of supply on account of expansion in acreage, procurement, buffer stocking and imports caused a sharp decline in prices starting in August 2016. Propelled by significantly higher arrivals in mandis relative to the seasonal pattern, prices of vegetables also fell markedly from July and bottomed out in January 2017, with fire sales during the demonetisation period accentuating the fall. The seasonal uptick that typically occurs in the pre-monsoon months has been muted so far. In the fuel group by contrast, inflation surged across the board. Prices of liquefied petroleum gas (LPG) and kerosene rose in sympathy with international prices even as the subsidy was set on a path of calibrated reduction. Fuel used by rural households rose for the third month in succession, narrowing the wedge between fuel inflation facing rural and urban households. In response to these developments, inflation expectations three months ahead and a year ahead surveyed in the Reserve Bank’s inflation expectations survey of households have ticked down marginally. 11. Excluding food and fuel, inflation dipped 60 basis points from a month ago to 4.4 per cent. The delayed and cumulative downward adjustment of domestic petrol and diesel prices in April to the softening of international crude prices in preceding months was among the factors at work. Inflation in respect of services embedded in transport and communication, education, recreation and health also moderated. The industrial outlook survey and the PMIs for manufacturing and services indicate that pricing power remains weak. 12. Even as surplus liquidity in the banking system post-demonetisation was drained by the ramping up of new currency in circulation by ₹ 1.5 trillion in April and May, massive spending by the Government re-injected liquidity into the system, raising the daily average overall surplus liquidity in the banking system to ₹ 4.2 trillion in April and ₹ 3.5 trillion in May. Unwinding of the excess reserves that banks used to dress up balance sheets for end-March also resulted in an accretion of ₹ 0.8 trillion to the surplus liquidity. Absorption operations undertaken by the Reserve Bank in the context of these developments and the consequent downward pressure on money market rates consisted of ₹ 1 trillion impounded through issuance of treasury bills (TBs) of tenors ranging from 312 days to 329 days under the market stabilisation scheme (MSS), auctions of cash management bills (CMBs) of ₹ 0.7 trillion triggered by the decline in cash balances of the Government, and variable rate reverse repo auctions of different tenors which took in the remaining surplus liquidity averaging ₹ 3.8 trillion in April and ₹ 3.4 trillion in May. With the narrowing of the the LAF corridor from +/- 50 bps to +/- 25 bps in April 2017, these operations ensured that the weighted average call money rate (WACR) – the operating target of monetary policy– broadly traded within the corridor. The spread between the WACR and the policy repo rate narrowed from 29-32 basis points (bps) in March-April to 21 bps in May. 13. Merchandise exports posted double digit growth in March and April 2017 in an environment of slowly improving global trade, with 80 per cent of this expansion contributed by engineering goods, petroleum products, gems and jewellery, readymade garments and chemicals. Merchandise imports also increased sharply, propelled by domestic demand, with the jump of 47.2 per cent in US dollar terms not recorded since 2011. Imports of petroleum and products rose strongly on price effects as international crude prices firmed up in the wake of OPEC’s productions cut. Gold imports also surged in volume terms, initially driven by seasonal and festival demand but subsequently by stockpiling in anticipation of the roll out of the goods and services tax (GST). Non-oil non-gold imports contributed about half of the total import growth in March and April, reflecting higher recourse to electronic goods, pearls and precious stones, coal, machinery and machine tools from overseas markets. With import growth significantly outpacing export growth, the trade deficit increased sizably. The current account deficit (CAD) for the year 2016-17 is likely to remain within 1 per cent of GDP. Unlike in the immediately preceding quarter, capital flows in April-May 2017 were dominated by foreign portfolio investment (FPI), pushed out by risk-on investor sentiment as global growth prospects improved. Also, clarity emerged on taxation issues in the Union Budget and the expectations of faster structural reforms were fuelled by the decisive outcome of State elections. The level of foreign exchange reserves as on June 2, 2017 was US$ 381.2 billion. 14. The abrupt and significant retreat of inflation in April from the firming trajectory that was developing in February and March has raised several issues that have to be factored into the inflation projections. First, it needs to be assessed as to whether or not the unusually low momentum in the reading for April will endure. Second, the prices of pulses are clearly reeling under the impact of a supply glut caused by record output and imports. Policy interventions, including access to open trade, may be envisaged to arrest the slump in prices. Third, the accumulated downward adjustment in the prices of petrol and diesel effected in April has been largely reversed on June 1. Fourth, the easing of inflation excluding food and fuel may be transient in view of its underlying stickiness in a situation of rising rural wage growth and strong consumption demand. Thus, the April reading has imparted considerable uncertainty to the evolving inflation trajectory, especially for the near months. 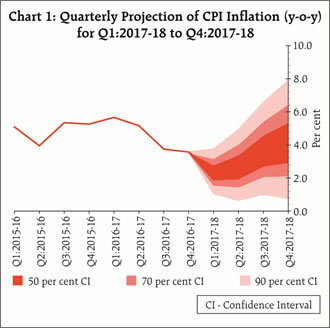 If the configurations evident in April are sustained, then absent policy interventions, headline inflation is projected in the range of 2.0-3.5 per cent in the first half of the year and 3.5-4.5 per cent in the second half (Chart 1). Risks are evenly balanced, although the spatial and temporal distribution of the monsoon and the government staying the course in effective food management will play a critical role in the evolution of risks. The risk of fiscal slippages, which, by and large, can entail inflationary spillovers, has risen with the announcements of large farm loan waivers. At the current juncture, global political and financial risks materialising into imported inflation and the disbursement of allowances under the 7th central pay commission’s award are upside risks. The date of implementation of the latter is still not announced and as such, it is not factored into the baseline projections. The implementation of the GST is not expected to have a material impact on overall inflation. 15. 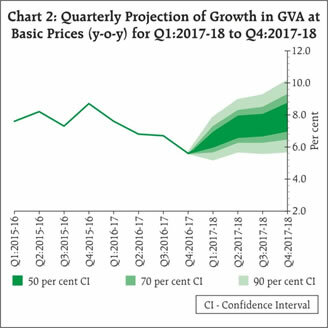 With the CSO’s provisional estimates for 2016-17, the projection of real GVA growth for 2017-18 has accordingly been revised 10 bps downwards from the April 2017 projection to 7.3 per cent, with risks evenly balanced (Chart 2). The continuing remonetisation should enable a pick-up in discretionary consumer spending, especially in cash-intensive segments of the economy. Furthermore, the reductions in banks’ lending rates post-demonetisation should support both consumption and investment demand of households and stress-free corporates. Moreover, Government spending continues to be robust, cushioning the impact of a slowdown in other constituents. The implementation of proposals in the Union Budget should crowd in private investment as the business environment improves with structural reforms, including the GST, the Insolvency and Bankruptcy Code, and the abolition of the Foreign Investment Promotion Board. Strengthening external demand will likely play a more decisive role in supporting the domestic economy. In addition, the new IIP broadens the recognition of industrial activity. On the downside, global political risks remain elevated and could materialise. Second, rising input costs and wage pressures may prove a drag on the profitability of firms, pulling down overall GVA growth. Third, the twin balance sheet problem - over-leveraged corporate sector and stressed banking sector - may delay the revival in private investment demand. 16. The MPC noted that incoming data suggest that the transitory effects of demonetisation have lingered on in price formations relating to salient food items, entangled with excess supply conditions with respect to fruits and vegetables, pulses and cereals. At the same time, however, the CSO’s latest releases on national income accounts and industrial production attest to the effects of demonetisation on the broader economy being sector specific and transient, as well as to the noteworthy resilience of private consumption. At this stage, it is difficult to isolate these factors or to judge the strength of their persistence. As the year progresses, underlying inflation pressures, especially input costs, wages and imported inflation, will have to be closely and continuously monitored. 17. Noting that inflation has fallen below 4 per cent only since November 2016, the MPC remains focused on its commitment to keeping headline inflation close to 4 per cent on a durable basis keeping in mind the output gap. The current state of the economy underscores the need to revive private investment, restore banking sector health and remove infrastructural bottlenecks. Monetary policy can play a more effective role only when these factors are in place. Premature action at this stage risks disruptive policy reversals later and the loss of credibility. Accordingly, the MPC decided to keep the policy rate unchanged with a neutral stance and remain watchful of incoming data. 18. The Reserve Bank will continue to work in partnership with the government to address the stress in banks’ balance sheets. Better alignment of administered interest rates on small savings with market rates and stepped-up recapitalisation of banks to facilitate adequate flow of credit to productive sectors are important steps to follow through. 19. Five members were in favour of the monetary policy decision, while Dr. Ravindra H. Dholakia was not in favour. The minutes of the MPC’s meeting will be published by June 21, 2017. 20. The next meeting of the MPC is scheduled on August 1 and 2, 2017.